Most people know about green anacondas, but today I want to write about their smaller cousins, yellow anacondas. They may not be as big as green anacondas, but they are still pretty big, growing up to 4.5 metres long. The females are bigger than the males. Yellow anacondas mainly eat wading birds, but they also eat fish, small deer, peccaries, capybaras, turtles and small caimans. They aren’t poisonous, but use their strong muscles to constrict their prey before swallowing it whole. They have a very slow digestive system and can go for months without eating after a big meal. At breeding time, the females produce a smell that attracts males. The female and multiple males form breeding balls where they all get tangles up together. They give birth to up to 80 live babies that are about 60 cm long. 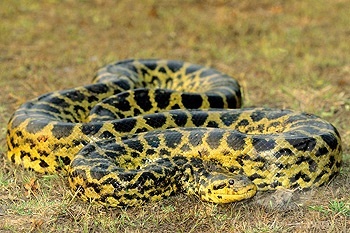 Yellow anacondas can be found in swampy areas in Paraguay, Brazil, Argentina and Bolivia. They are considered near threatened due to hunting for their skin, poaching for zoos and the pet trade and habitat loss. Are there any other interesting facts that you would like to share about yellow anacondas?